Allen, 48" Diameter, stainless steel, continuous motion coating drum with pounds of product per hour – depending on materials, application and machine configuration. 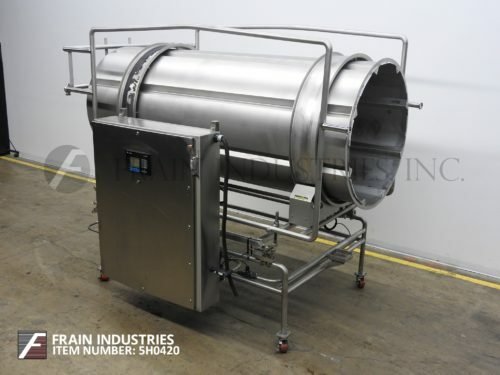 Equipped with a 48" diameter x 120" long coating drum with (8) 2½" wide fixed interior soft flight baffles, 2 Hp drum roller motor drive, 10" diameter charge port with a 66" in feed height and 48" diameter discharge with 48" discharge height. Control panel with an AB controller and AB PanelView 600 display screen. Mounted on a stainless steel base frame with 1125 lbs capacity load cells and casters.